“At one stage, we were cruising at 75 off 8 overs, it was sad that the side couldn’t pull it off together,” said Virat Kohli of his side’s failure against Rajasthan Royals. This meant the Bangalore-based side failed to qualify for the playoffs for the second time in a row. 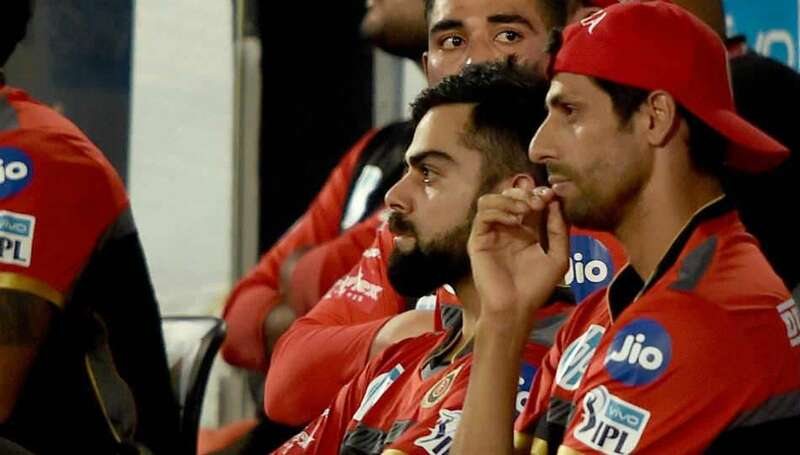 Perhaps, it could be argued in that instant of speaking his mind about his boys, RCB’s captain summed up the approach as also the reason for the side’s cataclysmic failure in the IPL. Were they able to play together as one side, one team, one entity responsible for bringing the results? You don’t need to be a Harsha or a discerning mind in the dugout to answer that. Just a few nights ago, when De Villiers went anti-gravity and produced a stunner out of thin air, sending Hales back, RCB believed a turnaround was in the offing. A few overs later, they stunned IPL’s current table-toppers. Against arguably the best IPL bowling side, Kohli’s side unleashed “Virat-power” in producing 218 runs on the board. De Villiers batted like a god. Moeen Ali slammed some huge blows and RCB’s best came against arguably the best side in the IPL. You surely judge a side’s quality by its ability to match shoulders with the giants. Don’t you? Then, a game later, against arguably one of IPL’s weaklings this season- Rajasthan Royals- the same RCB that splintered the best side earlier, failed to chase 165 off 120 balls. You also surely judge a side’s quality by its failure to overcome an arguably weaker side, don’t you? As fans struggled to wrap brains around how on earth were 8-an over not chased down in a must-win game, their performances highlighted perhaps the essence of their efforts this season. It’s not every day that a team that races away to 75 off just 8 fails to reach 165, isn’t it? In a space of two games did RCB go from being mighty bashers into a rustic outfit, so susceptible to unforeseeable collapse. While RCB’s failure to qualify for playoffs highlights their 2018 woes, the fact that familiar scenes occurred the last time around in 2017 presents the possibility for a pattern. One doesn’t need to be a Harsha or a discerning mind in their dug-out to know that RCB are bloated with the champion blades of De Villiers and Kohli. To top it up, the presence of an experienced marksman in the game- Brendon McCullum- only heightens their batting. You can be pulverized at the mere thought of being tasked to bowl at a side gifted with dashers- Moeen Ali, De Kock, Sarfaraz Khan included. This year, they put on an extra few kilos of batting potential in Grandhomme and Corey Anderson. Despite such fluff, why was there hardly any gravitas? Perhaps an often hugely unappreciated rule of the IPL is that while it is a team game woven around individual performances, the same has to surface in quick intervals. And for going the long way, consistently so. Moreover, individual brilliance can fetch one or two results. The team has to ferry around main planks of the side. So while in De Villiers- 480 runs- and De Villiers- 530 runs- there was no dearth of swash-buckle, did the rest of the side play around these superstars? Did RCB’s support batting stars do enough to ease Kohli, AB’s burden? If you were to look elsewhere toward the CSK, SRH or Mumbai dugout, you’d find that the teams aced with support players adjoining forces with star players. While Rohit Sharma had the likes of Suryakumar Yadav contributing mightily well alongside the Pandya brothers (with Evin Lewis chipping in every now and again), SRH had the likes of Manish Pandey, Dhawan playing around IPL orange-cap holder Williamson. Chennai didn’t seem to depend on Dhoni one bit, who’s been in as great a form as ever. Rather, it became a spectacle with Watson, Bravo, Billings playing around Rayudu. From 13 and 14 games so far, Dhawan and Pandey sit on 437 and 276 runs respectively. In 13 games, Krunal Pandya has amassed 224 runs and 11 wickets while Suryakumar Yadav has collected 500 runs respectively whereas, while Rayudu and Watson have plundered 585 and 438 runs, respectively, even as Dhoni on his own was firing all cylinders and is set to add to 430 runs. While in both AB and Kohli, RCB had services of two plundering blades who struck 530 and 480 runs respectively, what did McCullum and de Kock do? Do 127 runs from 6 games at 21 a game justify the huge cost RCB shelled for the former Kiwi captain? Moreover, Parthiv could manage a few more than McCullum, scoring just 153 from 6 games? Did this lack of support from experienced talents curb RCB’s advance? It’s anyone’s call. The Kiwi duo, Grandhomme and Corey Anderson didn’t contribute to their team’s cause a bit. Did 2 wickets from 9 games and 131 runs justify Grandhomme’s ability as an A-level all-rounder? Thankfully, by playing Corey Anderson in just 3 games, saved RCB undercut a fair deal of damage. He contributed just 17 runs and scalped 3 wickets but by giving the ball to Anderson in death overs in initial games, a star who last played a T20 contest in a recognizable stage for New Zealand a year ago, Kohli allowed his side to be mowed down by an axe he himself chose. Thus far, Kohli has garnered not the most rave reviews for his captaincy. Why was AB made to sit out for 2 games despite knowing well that RCB so needed the spankings of his bat didn’t reflect well on Virat’s game plan. And where bowling was concerned, Murugan Ashwin and Siraj went for far too many runs to ever look potent to lend support to Umesh Yadav, the only RCB bowler who can bow out with his head held high. Lastly, RCB are not masters of keeping a cool head under pressure. Perhaps taking a leaf from SRH and CSK can hold them in good stead in their next run. Their close games against SRH (earlier) and Kolkata went into final overs and they weren’t able to achieve breakthroughs at the back of the guile of their bowlers. If the Royal Challengers, only one of the three IPL sides alongside King’s XI and DD are to go the long way forward, they’ll have to identify potential match-winners who AB and Virat can rely on instead of weighing only on their familiar matchwinners. NextCan Rajasthan Royals seal a place in the playoffs?